The patented, wedge-shaped spikes of the Seed Stitcher create funnel-shaped holes through the mulch or lawn thatch without ripping it up, so seeds can easily slip into the soil. Seeds germinate when surrounded by soil and flourish with sunlight and water. Weed seeds remain sheltered from the sun, making it harder for them to grow. In our tests of the product, it proved to be more effective than the normal method of loosening soil with a garden rake before seeding. The lightweight aluminum construction with heavy duty welds is built like a commercial grade tool. 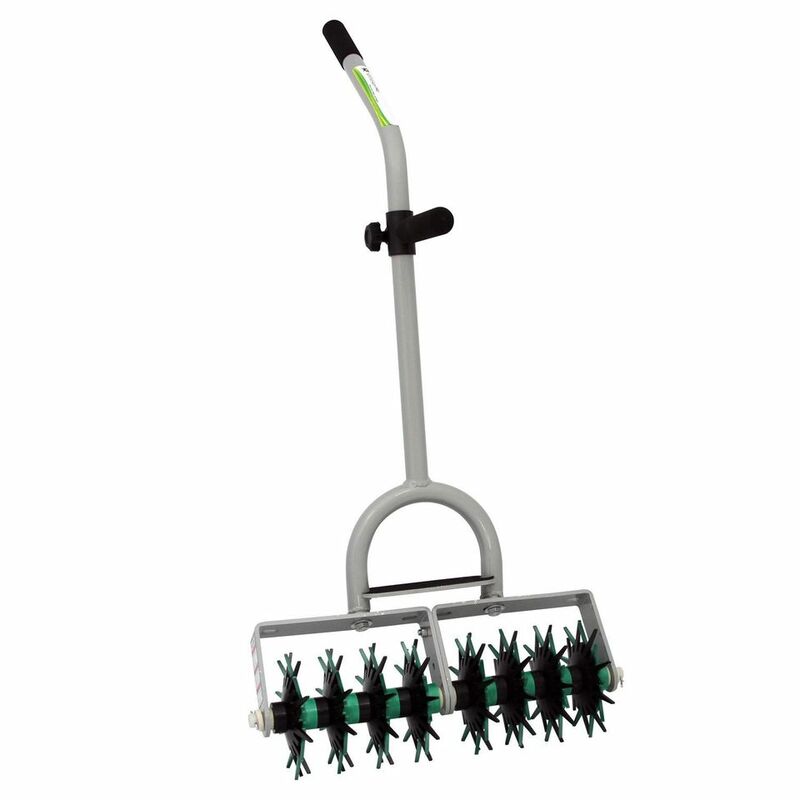 The angled shaft, adjustable handle, and foot pad ensure proper ergonomics and ease of use in any soil type. An additional head can be installed for large repairs. The tines are made of durable, hard plastic, "guaranteed not to break." Easy to use, requires little effort. Creates perforations ideal for seed growth. Comes with a full lifetime warranty. At pricing ranging from $60 to $130, it's a little pricey. The tool is now offered in both a homeowner and "pro" version, and there's probably not enough advantage to the pro model to warrant purchasing it over the homeowner version. Consumer reports are mixed. The main complaint is that the tool is not as durable is it might be. Guarantee notwithstanding, this may not be the sturdiest tool in terms of construction. This specialized seed preparation tool proved to be an improvement over standard rotary garden cultivators-at least for the purpose of preparing soil for seed planting. Then again, the rotary cultivator is designed for a different purpose. Garden cultivators break up the surface of the soil but aren't perfectly suited to prepare a seed bed for sowing grass. The grass stitcher is a completely different tool for a very specialized job. Grass seed requires specific conditions for proper germination: adequate depth, soil to seed contact and adequate moisture. The grass stitcher’s tines provide the proper depth by creating a perforation surrounded by the disturbed soil. Once the seed is sown, a light watering moves the soil into place over the seed ensuring adequate soil to seed contact and protecting the seed from drying out. In our tests, within a week or so bare patches prepared with the Seed Stitcher saw full germination and quickly filled in to completely eliminate the bare patches. Repairing bare and thin areas, and staying on top of them is an effective way to keep a lawn competitive in the battle against weeds, especially crabgrass. An aggressive campaign of seeding can be as effective (and safer) than chemical crabgrass controls. In our moderate usage tests, the tool held up to our satisfaction, but one can see that under heavy usage on hard, dry ground, the plastic tines might not hold up. Homeowners would be well advised to make sure the lawn is well watered before preparing the soil and seeding. The Seed Stitcher performs well as a seeding preparation tool, but it is not a cultivator and should not be expected to perform like one. While a rotary cultivator can be used as a moderately effective tool for seed preparation, the Seed Stitcher is not at all suitable to serve duty as a cultivator. The Seed Stitcher will appeal to homeowners who like having tools designed for specific purposes. For others, though, the more versatile rotary cultivator might be the only tool of this type they want, since it can fill in as moderately effective seed preparation tool--and is less expensive.